An alpha particle entering the body via inhalation or food is very harmful because, in this case, living cells are damaged instead of dead skin layers. In particular, the accumulation of alpha radiation of a decaying nuclide in an organ leads to a high burden on the organ, because a high radiation dosis has damaging effects in a small area on important body cells (radiation sickness). Alpha radiation is easily shielded. Principally, the incorporated dust filter is already enough. The range of beta radiation in the air is several meters and it penetrates biological tissue about 1 cm deep. The deposit of particles on unprotected skin can cause severe radiation damage due to the high ionization ability: burns on the skin with an after effect of skin cancer are possible. Beta radiation incorporation into the human body heavily burdens the surrounding areas in the body; thyroid and bone marrow cancer as well as leukemia are known after effects. For this reason an adequate shielding is absolutely necessary. Beta radiation is completely absorbed by copper with 1 mm thickness (at 2MeV). The Ding-Filter contains the appropriate amount of copper. For cellulose you would need almost 10mm. Gamma radiation is the third and most well-known radiation type and also the most dangerous. Because of its enormous range and high ability to penetrate matter, it is able to cause the severest injuries, burns, and even changes to the genetic makeup. For gamma radiation, a maximum range cannot be specified. 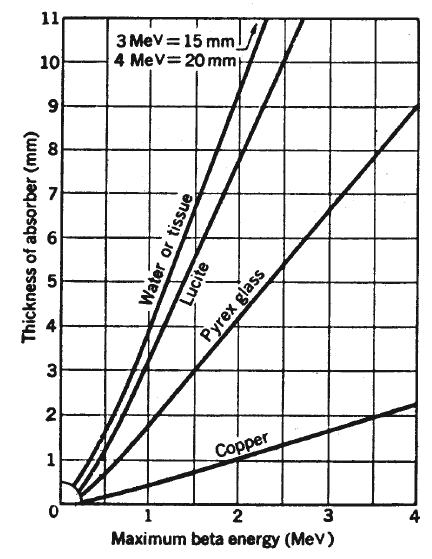 With absorption materials, one can only achieve an attenuation of the radiation intensity. How much the radiation weakens depends on the type of absorption material used as well as the energy of the gamma radiation. The only suitable absorption in the case of strong radiation is lead. In the case of low radiation, as it occurs in the areas outside of the restricted zones, copper is very well suited. In order to reduce radiation of 100 keV by one half, one needs 1,8mm copper, of 50 keV, 0,3 mm copper is sufficient.